George Osborne in the last few weeks of the EU referendum campaign appears to morphing form a to Euro-phile into a Euro-skeptic, effectively coming full circle as his most recent statement illustrates, warning that a BrExit would result in the UK housing market becoming MORE AFFORDABLE for the British people, presumably because there could be 5 million LESS NEW EU migrants by 2030 and thus the pressure cooker that is the UK housing market should gradually cool due to reduced demand from the current insane levels that has the UK building 140,000 homers per annum which is set against net migration of at least 500k per year, let alone the pressure from new domestic demand. 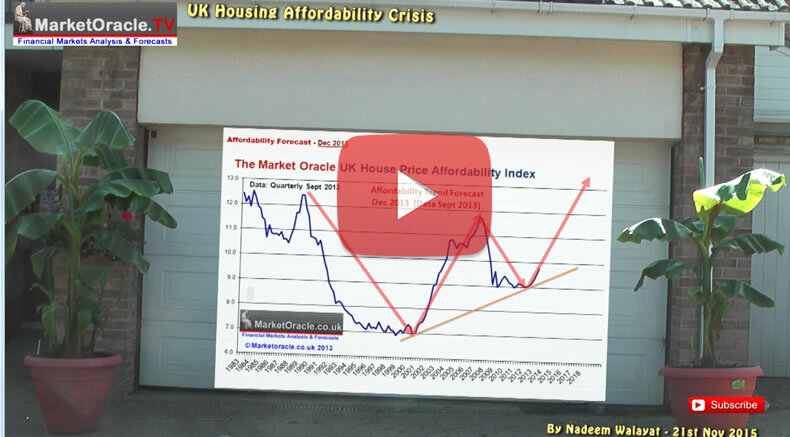 Therefore each year for the past 15 years Britain's housing crisis has relentlessly worsened as new supply has been nowhere near able to keep pace with both domestic demand PLUS 1/2 million extra migrants to house per annum! Recent UK average house prices data (£212,859) is showing a 3.6% deviation against the forecast trend trajectory, which if it continued to persist then in terms of the long-term trend forecast for a 55% rise in average UK house prices by the end of 2018 then would translate into a 9% reduction in the forecast outcome to approx for a 46% rise by the end of 2018. Therefore the UK housing crisis is not just one of the inability of the housing market to cope with current demand, but as the earlier housing affordability trend graph illustrates that the crisis is going to get much WORSE with each passing year, which ultimately means an social EXPLOSION of some kind, maybe not a revolution but it's not going to look pretty! Whilst a BrExit bringing a halt to out of control immigration would provide a mechanism that gives Britain time to at least stabilise the current crisis, whilst a REMAIN vote guarantees that UK housing will continue to become ever more unaffordable, which will especially hit young people and families HARD! All because the vested interests in the establishment want cheap labour that the tax payer picks up the bill for in terms of in work benefits and the people of Britain pay the price for in terms of the slow motion collapse of society as literally each service after service FREEZES! EU Referendum BrExit - Last Chance for Britain! The latest EU referendum opinion polls put the LEAVE and REMAIN camps virtually neck and neck on 44% with 12% of those polled undecided. Which compares against a month ago of 42% LEAVE and 48% REMAIN, 10% undecided. So it is no wonder that the REMAIN camp has gone into full blown panic mode with a relentless torrent of fear mongering emanating from the establishment REMAIN camp. 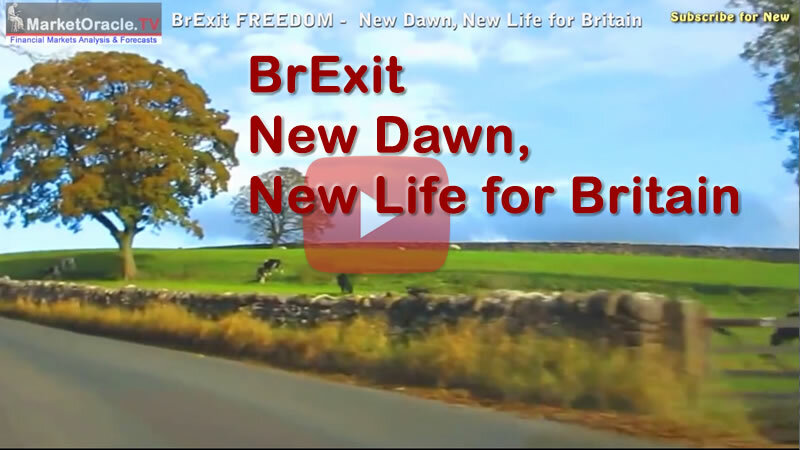 Instead I offer my latest video in this series as a message of HOPE, a message of a New Dawn, New Life for Britain! With just 5 weeks to go the Market Oracle's own 9 month long BrExit campaign has been ramped up a few gears as we enter this last stretch, producing Brexit resources from in-depth analysis, rebuttal articles such as this, many videos, and also active on the social networks so as to do our best to play a part in Britain wasting it's very last chance to avert catastrophe which you too can support allowing us to further intensify our efforts to counter the daily barrage of REMAIN propaganda as well as keep producing video's that help spread the BrExit cause. Please explain how brexit will help contain 200k per year outside EU immigration? If anything, lower level of EU immigrants will push salary higher attracting even more outside eu people. Outside EU is controlled. Inside EU is uncontrolled. And its not just about what has transpired it is also about what is to come as my next in-depth analysis will cover. If this was true that UK government would had slammed breaks on at least what it could in theory control - outside EU immigration,but they didn't. Now, someone is looking for scapegoats to cover this up with brexit. I also disagree about luck of control on eu immigration. Majority of it were one off factors life poland or Romania joining eu. Germany and france applied brakes but uk gov did not thinking that 10 of thouthands will come. Benefits system is another magnet - make it fair to middle class and workers and much less people would come. All examples demonstrate the total incompetence or sone other vested interests at play that will persist in or out of EU. I'd rather see UK to fix outside EU immigration to promised numbers first. Revamp benefits gravy train and then consider EU impact. As a summary, it is a huge political sharad to cover up a lot of mismanagement and imminent debt crises brought on uk by itself! As my forthcoming in-depth analysis will make it crystal clear! Pull all of the strands together and forecast whats likely to transpire over the next few decades .. There will be no break-up in Ukraine. Civil war is not possible, as people either support opposition, or do not support regime. You cannot compare Ukraine and UK. The better comparison is UK and Russia: 2 ex-empires built on blood of others. Well, UK is like Russia in maybe 50-80 years. Scotland and England is like a little example of Russia and Ukraine.